Our Work Party was delighted to be joined today(11.11.14) by some more volunteers from the Virgin Media Call Centre at Llansamlet. 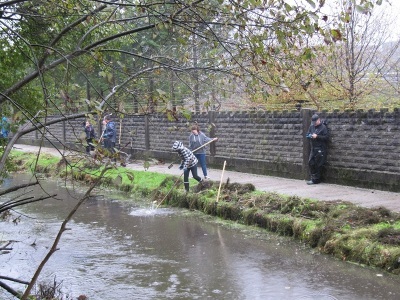 They worked hard and long at clearing Canadian Pond Weed and other debris from the canal behind the Co-op Supermarket in Clydach. We are very grateful to have such enthusiastic supporters. It was special day too for our partnership with Whitethorns Day Care Centre as the mural depicting the partnership between the Centre and the Society over which Whitethorns have spent many hours was brought down to the canal for us to see. It was well worth it. A glittering sun shines through cotton wool clouds over the canal as it snakes past Brownsters cafe. Two of our boats are collecting litter from it but the healthy future of the Swansea is foreseen by the magnificent blossoming tree on the left of the canvas. An Evening Post photographer was present to record the ‘unveiling’. Many, many, thanks to our friends at Whitethorns and at Virgin Media.